Surplus Rack has been providing top notch industrial material handling equipment for the Mid- Atlantic region since 1988, with the most extensive supply of pallet jacks, rolling ladders, maintenance cages, carts, levelers, and dollies available anywhere, and they are ready to equip you with everything you need for your facility. The supply chain and storage industry has seen advancements in virtually every phase of the process, with streamlined equipment designed to add strength, remove bulk, and provide more flexible options along the way. For example, pallet jacks offer the ability to move loads efficiently in and around a facility without the bulk of forklifts, and with less operator training. Surplus Rack offers a wide assortment of pallet jacks designed for particular applications, from heavy duty and all terrain pallet jacks, to electric powered low lift or high lift models. There are even pallet jacks equipped with scales for precision loading. 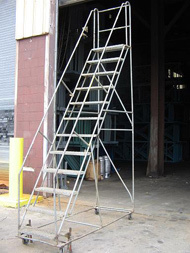 Other types of industrial material handling equipment, such as carts, levelers, dollies, and rolling ladders are constructed of lightweight materials with greater strength, allowing for better performance and increased ease of movement. Convenient maintenance cages can be readily installed in existing spaces for an effective partition system inside a larger facility. These lockable enclosures make it easier to create spaces with ready access to floor operations, combining complete visual transparency with full security. 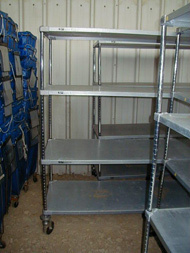 Of course, Surplus Rack also offers the most complete line of warehouse shelving available in the area. As an experienced industrial material handling equipment supplier, Surplus Rack can help you match the different types of pallet jacks with the appropriate shelving system. Whether you are looking for a new or used system, your facility will be setup with the right shelving for your needs and the associated industrial material handling equipment to service it efficiently. Discuss your needs with Surplus Rack to get the best pallet jacks, rolling ladders, maintenance cages, carts, levelers, and dollies you need to keep your business moving.